Not very long ago every engineer's best friend was their wirewrap tool when it came time to prototype, or "breadboard", a new design. Going out for a PCB design and fab was both time consuming and very expensive. Most "Design Service Bureaus" had a standard leadtime of at least 3 weeks, and fab shops took at least as long and then made you buy as many boards as would fit on a panel. Two recent developments have reduced both the time and cost of using a real PCB for prototyping - good autorouters and panel sharing. 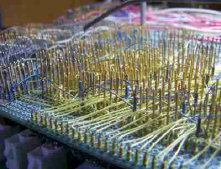 While the engineer may want to avoid autorouting for the final design, the result is usually acceptable for a prototype spin on a board without high speed signals, and many shops can provide one or two boards for a very low cost, especially when the time wirewrapping or soldering hundreds of connections are considered. A five day turn is now close to minimum price but even a 3 day turn can make economic sense if the schedule is tight. Next day turns do cost more, but at this point it may not be possible to produce a board as quickly on the bench.